Yesterday, I was given the gift of time. You know how when you return from a long weekend trip, you spend the better part of the week catching up on things you typically do during the weekend? I’m in that boat right now. The thing at the top of my to-do list was: go get my baby! I missed him so. However, this involves an hour long round-trip drive to my aunt’s house. Lucky for me (so lucky!) she had to be in Charlotte that evening and suggested we meet her to pick him up. 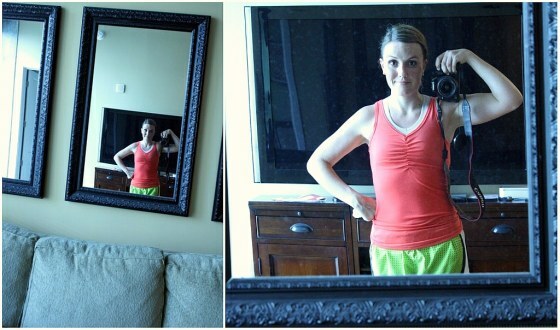 And just like that I had time for an evening run! I did six shweaty miles total in an unknown period of time. I never wear my Garmin when running from Uptown. The tall buildings block the satellites and it takes 10+ minutes for Garmin to locate my whereabouts. Meanwhile, Brad went to pick up my little Rascal and swing by Chloe’s to pick up our share of the CSA. I actually ran into them in Dilworth, while Brad was sitting at a stop sign. I took the opportunity for a brief rest and to receive a lot of puppy kisses. Rascal sure missed his mama! Dinner was easy and scrumptious. Sprinkle salmon generously with salt and pepper. Warm olive oil in a pan. Add garlic and cook, stirring occasionally until they begin to soften. Add salmon to the pan. Cook thoroughly on medium high heat for about five minutes on each side. Remove salmon from pan and leave the garlic. Keep warm by putting on a plate in the oven on warm setting or by covering with aluminium foil. Reduce heat to low. Add bourbon to pan and stir to mix with the garlic. Add honey and stir again. Cook for about two minutes or until the mixture reduces by half. Add broth and turn heat to medium. Add corn starch and whisk quickly to thicken the mixture. Cook about two additional minutes or until mixture reduces by half and thickens to a syrup consistency. 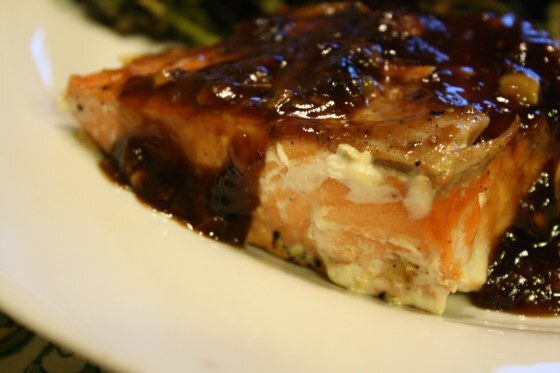 Plate salmon and spoon half of the honey bourbon sauce over each fillet. Leave the skin on your potatoes and beets for some extra fiber and time saved prepping. Preheat oven to 425 degrees F. In a large boil toss all ingredients together (except salt and pepper), mixing well. Spread on a baking sheet so that none of the vegetables overlap. Sprinkle generously with salt and pepper. Roast for 15 minutes, stir, then return to the oven. Roast for an additional 15 minutes or until potatoes begin to brown around the edges. 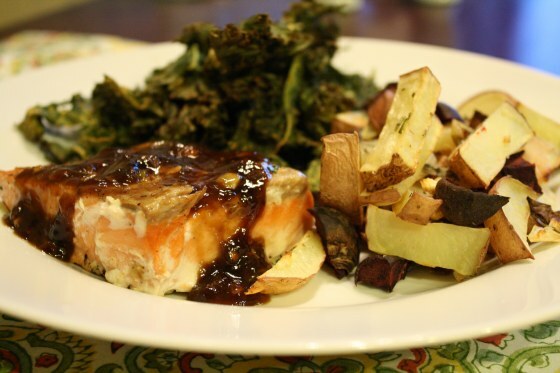 I used up the last of last week’s kale and made room for new CSA veggies with this recipe. 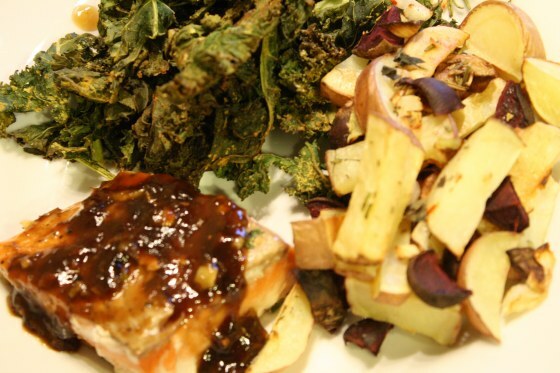 I’ve seen similar recipes for kale chips out in the blog world for forever! Why did it take me so long to make these delicious little flakes? I liked this so much more than plain kale chips and that’s saying something, because I love them plain too. These didn’t even need ketchup! Preheat oven to 425 degrees F. In a small bowl mix together oil, vinegar, salt, and 2 tsp. of the nutritional yeast. Place kale in a large mixing bowl. Pour liquid mixture over kale and toss with hands or serving utensils to mix well. Add additional 3 tsp. of nutritional yeast and mix again. Spread kale evenly onto a baking sheet. 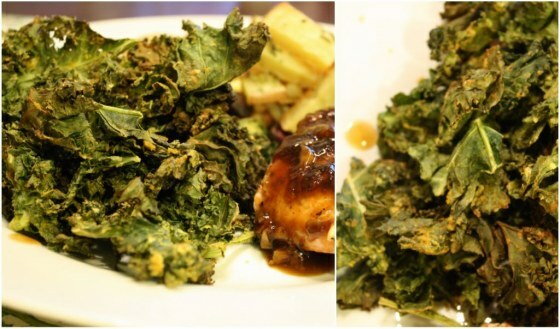 Cook for 20-25 minutes, stirring and flipping kale chips after 15 minutes. 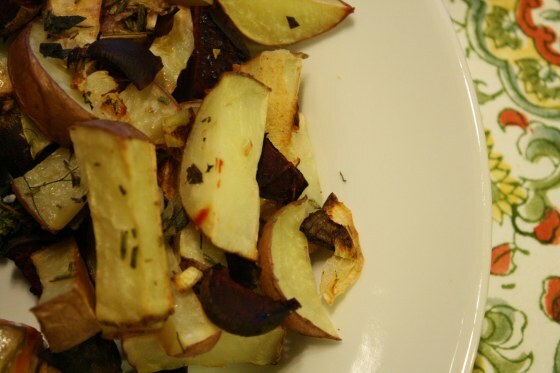 *These can be cooked at the same time as the roasted potatoes and beets, but they do not need to cook quite as long. Maybe it was my six mile run and my grumbling stomach or maybe this meal was just that delicious, but I absolutely loved everything on my plate. I’ve made bourbon sauce before, but this will definitely be my new go-to. The sauce was sweet and galicky and complimented the flaky salmon so well. I also really enjoyed the contrast of the red potatoes and the beets. The onions crisped perfectly and were actually sweeter than the beets once fully cooked. Brad and I both loved the kale chips! He said that my version is way better than the store-bought kind we purchased at Whole Foods this past weekend. I’ll take that compliment to mean that I should definitely make these again. Happy Wednesday! Can you believe we’re already almost halfway through the week. I think every week should be a four-day work week. Mondays are so overrated.